Learn what Business-Driven Development is, how it works, and how to use it with popular Scala development and testing tools. This article aims to give a brief explanation of what BDD is and how it can be used to fill the information gap between stakeholders and development teams, ensuring everyone (technical or not) is involved in the project’s progress. The first time I had contact with this approach to software development was a few years ago during a Massive Open Online Course (MOOC) and, I must warn you, I've never applied it in production. Nevertheless, I'm fully aware this is not the holy grail and it might not work so well as advertised, but the idea of having everyone on the team (not only developers) collaborating on the development process sounded very romantic to me. In the past few months, I've been working with Scala and I've been thinking about what would be the best way to apply BDD using the most popular testing tools in the Scala environment (ScalaTest and Specs2) and the most popular BDD tool: Cucumber. In this article, I will compare these three tools using a very simple example. BDD can be described, in very simplistic terms, as an extension of Test-Driven Development (TDD). 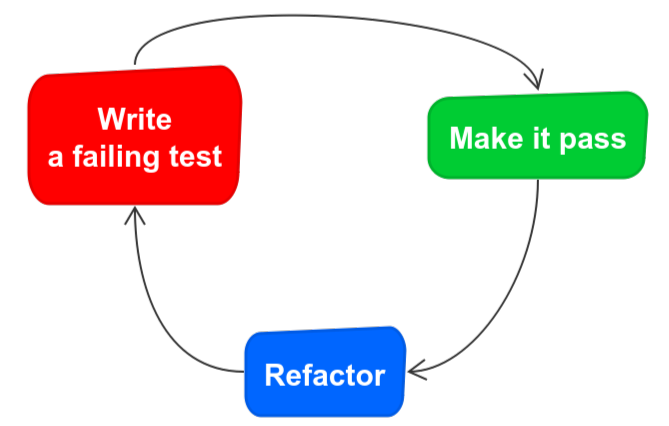 The typical TDD cycle, aka Red/Green/Refactor, starts with the development of a failing test. The next step is to write the code to make this test pass and finally, refactor the code in order to improve its readability and maintainability. In comparison, the BDD cycle is almost identical to the latter, except the first step is replaced by the writing of a specification, rather than the development of a test. This means that this first step can be done by a non-technical person, for instance, a member of the business team or a functional analyst with an understanding of how the system should behave. The best part is that this specification can be used for test automation in the development process. 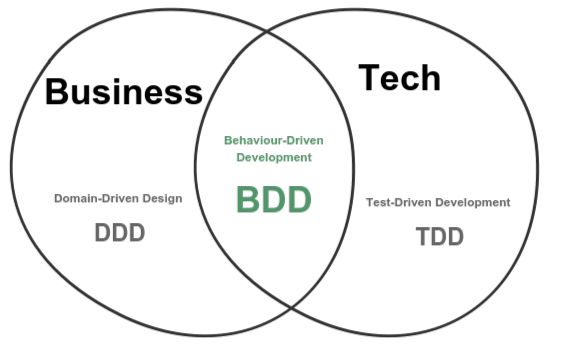 BDD can also be described as the intersection between Domain-Driven Design (DDD) and TDD. Domain-Driven design is an approach to software development aiming to deal with projects with complex business rules where collaboration between developers and domain experts (typically, this role is assumed by the client) is necessary to set a common language and a domain model that can be translated into very specific and detailed requirements. In BDD, these specific requirements are used to drive the development process in the first step of its cycle. Obviously, BDD can be put into practice without using a specific tool or framework, you just have to get people to collaborate, record that collaboration in some form of specification, and then automate that specification to drive out the implementation. However, there are tools that can help significantly in the automation process, so we don't have to find a new way to extract values from the requirements to automate tests. Cucumber is probably the most popular tool when it comes to BDD and it was the first one I worked with. 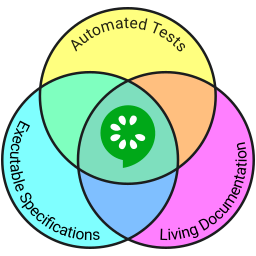 It is advertised as being capable to ease tests automation using executable specifications and therefore, generating living documentation that is easily understood by everyone. Gherkin documents are stored in .feature text files and it supports different dialects, so you can even write your specifications in Esperanto! I believe the code doesn't require any detailed explanation. It basically enables the creation of a BankAccount instance with a given amount of cash that can be debited and credited, but overdrafts are forbidden. Basically, we're just extracting the values from each one of the specification sentences and doing operations and assertions with those values. As you might have noticed (Codacy obviously noticed it), I had to sacrifice immutability, one of the building blocks of functional programming, by using two mutable variables to be able to do the assertions in the last steps. It would be cleaner if each step could return a value to be used in the next steps and do the assertions in the end. I wasn't the only one that noticed this limitation and some issues were already reported to make this more functional. However, it seems these improvements won't happen in the near future as it was announced the support for JVM languages was dropped, and this obviously includes Scala. ScalaTest is probably the most popular testing tool in the Scala ecosystem. It provides some traits facilitating BDD style, enabling a more grammatical structure in order to write tests as specifications. val expectedMessage = "overdrafts are not permitted"
The main difference I noticed when using ScalaTest compared with Cucumber is the specification text is inlined with the code and the Given/When/Then statements are basically just printed logs to the console, giving a greater level of granularity than just the test names. Therefore, the advantage of having the specification completely separated from the code is lost. As it is visible, the specification text is also not completely separated from the code but it is not inlined. It is in a separated string that could be easily extracted from some other place. In this string, we have to specify where the scenario starts, where it ends, and every line between these two points must correspond to a given, when or andThen call on the scenario. private val regex = ".*\\$(. *)$"
I think BDD, if correctly applied and with everyone is committed, can be a very efficient approach to software development, especially for projects where a significant number of team members don't have a deep understanding of the business logic. Having a way to formally specify what the system should do and how it should behave and use this specification for testing and documentation, can avoid many issues during the development process. About the tools comparison, despite Cucumber being the standard tool to practice BDD, I think Specs2 was definitely the best testing tool for this simple example in Scala. The project with the code used for this blog post is available on GitHub — feel free to check it out. Published at DZone with permission of Bruno Ferreira . See the original article here.